There are many fine restaurants on both sides of the Mississippi. 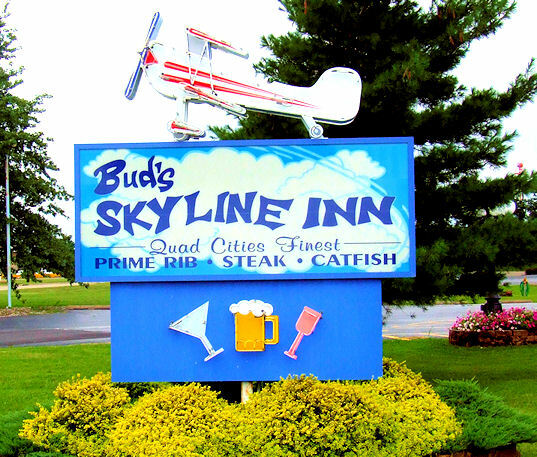 Bud’s Skyline Inn, adjacent to the Moline airport, was one of our favorite places to eat. But the airport has bought the property and will tear the restaurant down to make room for some as yet unspecified future development. I guess that is progress. But no matter what the airport puts there, I predict it will never top Bud’s, long known and loved for its aviation décor, great food and salad bar and friendly service. Owner Bud Canfield, who is in his 70s and has owned the place for 30 years, is retiring. He deserves a rest. But the restaurant’s closing marks the end of a popular Quad-Cities icon, and that’s a shame. We visited Bud’s the last Tuesday in September for a final meal there, and the place was packed. We waited in line for a table with about 50 other people who had the same idea. We arrived at 5:40 and were finally seated at 7, but the wait was worth it. The food and service were both delightful as always. I had a cup of cheeseburger chowder and a chicken dinner. My wife had a catfish dinner. I don’t know what the airport will put on the property after it tears the restaurant down, but if they were smart they’d leave everything just as is, hire an experienced manager to replace the retiring Canfield and reopen Bud’s without changing a thing. Why reinvent the wheel? I can’t imagine any new business of any kind on that property surpassing the success Bud’s Skyline Inn has achieved. — My wife and I enjoy live, local theater and sometimes become fans of individual actors we often see on stage. One of our favorites over the years was Michael Oberfield, who used his own name but, before that, the stage name Michael Kent for his performances in years past at Circa ‘21 in Rock Island. Michael Oberfield died Sept. 28 at age 70 in Florida. — I recently wrote in this space about Jeff and Kathy Fox, who, with their cat Ching, age 2 at the time, survived Hurricane Katrina a decade ago. You might recall that Ching escaped from the couple’s damaged house at one point after would-be animal rescuers, who had unsuccessfully searched for him, left the front door open when they departed. Ching was gone for weeks before finding his way back home. I am sorry to report that just days after my column was printed, Ching died. My condolences to the Foxes. Copyright 2015 by Phil Roberts, creative Enterprises. This piece will run as a column in The North Scott Press, Eldridge, Iowa. the photo is courtesy of budsskylineinn.com.